Following yesterday’s keynote teaser, Qualcomm has followed up by lifting the lid on its latest mobile platform – the Snapdragon 845. The chipset sports improvements across the board, ranging from new processing technology to an improved modem. Qualcomm’s press release is heavily focused on multimedia, virtual reality, and security, but we’re going to dive into everything that this chip has to offer next year’s flagship smartphones. As we’ve come to expect from Qualcomm lately, talk of changes to its CPU technology tend to be playing a backseat to the broader connectivity and multimedia improvements made across its chipset. Even so, we’ll dive right on into what, I think, most of you are here for. The Snapdragon 845 boasts a new Kryo 385 CPU architecture and an upgraded Adreno 630 GPU. The chip is built on Samsung’s 10nm LPP FinFET, its second generation 10nm node that offers “10-percent higher performance or 15-percent lower power consumption compared to its first generation”. 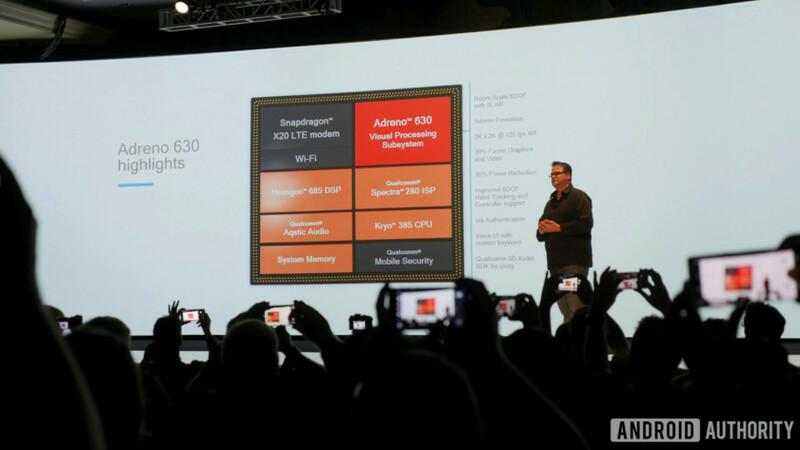 Just like last year, the Kryo 385 is “built on Arm Cortex technology“. In other words a customized off-the-shelf design from Arm, that Qualcomm says promises up to a 25 performance uplift compared with the last generation Snapdragon 835. Qualcomm is keeping its new Kryo 385 architecture close to its chest, but the introduction of a L3 cache reveals it's based on Arm's latest CPUs. As we predicted, this new design does indeed appear to be based on Arm’s DynamIQ technology and latest Cortex-A75 and A55 CPU designs. The giveaway is in the newly introduced 2 MB of shared L3 cache, a feature that was introduced with DynamIQ to greatly improve task and memory sharing capabilities between different core types in the shared cluster. The four performance cores clock up to 2.8 GHz and are paired with four energy efficient cores that can reach 1.7 GHz. Presumably these are now sat in the same cluster, giving the potential for superior energy aware task scheduling and lower memory latency. Moving past the CPU, there’s also an all new Adreno 630 Visual Processing Subsystem (I’m not sure why the term graphics processing unit has fallen out of favor). Even so, there’s a promised 30 percent improvement to graphics and video rendering and reduction in power consumption over the Adreno 540. Qualcomm has gone big on the augmented and virtual reality improvements with the Snapdragon 845 too. The Adreno 630 supports displays up to 2K x 2K in resolution at up to 120 Hz, for a crisp and fluid display. Foveated rendering, which lowerings rendering requirements by reducing resolution in your peripheral vision, is now supported via Adreno foveation. This package also includes tile rendering, eye tracking, multiView rendering, and fine grain preemption. The Snapdragon 845 is also the first mobile platform to enable room-scale 6 degrees of freedom (6DoF) of movement, with simultaneous localization and mapping (SLAM), which can enable features such as wall-collision detection. We couldn’t finish talking about processing without checking in with what Qualcomm is doing in the “AI” space. The Snapdragon 845 refuses to confirm to the trend of bundling in an AI processor, something that Apple and Huawei have played up recently. Instead, Qualcomm is doubling down on its heavily integrated approach to power intelligent machine learning applications. In terms of performance, the Snapdragon 845 boasts a 3x gain in AI tasks over the 835. This probably comes about from a combination of CPU and GPU improvements, but the Snapdragon 845 also includes a third generation Vector DSP with HVX, called the Hexagon 685, which is is optimized for AI and imaging workloads. The Snapdragon 845 boasts a 3x gain in AI performance, a 30 percent improvement to video rendering efficiency, and optimizations for VR rendering. Qualcomm points out that this system is tied in closely with the onboard Qualcomm Aqstic audio codec, in this case the WCD9341. This component offers low power monitoring for keyword detection and processing to help power virtual assistants. As well as boasting 130 dB of dynamic range, -109 dB THD+N, and support for 32-bit / 384 kHz PCM and DSD64/128 music playback support for audio enthusiasts. The Snapdragon 845 is also even more accessible for developers eager to get their machine learning applications up and running on the platform. The Snapdragon Neural Processing Engine SDK now supports TensorFlow Lite and the Open Neural Network Exchange, in addition to the original TensorFlow and Facebook’s Caffe/Caffe2. The Snapdragon 845 also supports Google’s Android Nueral Networks API for use with Android 8.1. On to multimedia, Qualcomm’s latest Spectra image signal processor has been rebuilt from the ground up. The new Spectra 280 ISP introduces a number of new video capture options, including 480 fps slow motion 720p video, 60 fps video recording at up to 16 megapixels of resolution, and the ability to capture 64x more high-dynamic range color information than before. The component can also handle power efficient multi-frame noise reduction, accelerated software image stabilization, and motion compensated temporal filtering, amongst others, helping to take the load of the CPU. 10-bit HDR support remains in place, complete with support for the Rec. 2020 gamut for 4K/Ultra HD content that pops off the screen. Although whether a smartphone’s display can actually fulfill those requirements is a different matter. To help download and share this higher quality content, the Snapdragon 845 boasts an improved Wi-Fi modem and the company’s X20 LTE modem for faster than gigabit data speeds. The X20 LTE modem its Category 18 LTE compliant for up to 1.2 Gbps downloads and 150 Mbps uploads. The modem also supports License Assisted Access (LAA) for unlicensed spectrum, 5x carrier aggregation, 4×4 MIMO on up to 3 carriers, and dual SIM-dual VoLTE. On the WiFi side, there’s diversity-enhanced 60 GHz 802.11ad Wi-Fi for more robust multi-gigabit coverage at speeds up to 4.6 Gbps. 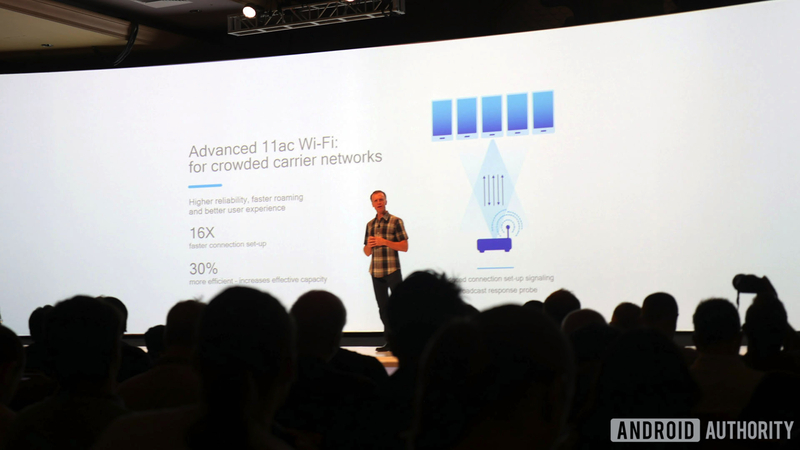 There’s also integrated 802.11ac Wi-Fi with advanced features that provide up to a 16x faster connection setup, simultaneous dual-band support, and 30 percent more capacity utilization. Downloading and uploading content shouldn’t be an issue. Rounding off the new features is the introduction of a hardware isolated security subsystem inside the Snapdragon 845, called the Secure Processing Unit (SPU). This dedicated piece of silicon acts as a vault for any saved biometric information, such as fingerprint, iris, or face scans, and builds on Qualcomm’s existing security software. The hardware can also be used for storing user and application security keys used for encryption, keeping them well removed from any potential software breaches that may occur at the app or even OS level. This design should keep sensitive data for financial payments and the like more secure, a much needed development as our phones house increasingly sensitive data. Fast charging is, of course, included in the chip too. This has been upgraded to Quick Charge 4+, which is designed to keep devices cooler, charge up to 30 percent more efficiently, and 15 percent faster than last year’s Quick Charge 4 standard. Finally, Bluetooth 5 support is included for connecting to the latest peripherals, along with aptX and aptX HD Bluetooth codec support for audiophiles who have gone wireless. Qualcomm states that it has made a number of proprietary enhancements to its Bluetooth 5 hardware too, which enables ultra-low power wireless earbud support and direct audio broadcasts to multiple devices. If you’ve been following Qualcomm’s Snapdragon roadmap over the past couple of years, much of the 845 will feel quite familiar. The 25 – 30 percent performance improvements aren’t to be sniffed at, but Qualcomm’s biggest strengths lie in providing a tightly integrated SoC optimized to cater for the ever expanding use cases for mobile. Looking at key trends for 2017 and 2018, the Snapdragon 845 appears well equipped to handle the different processing requirements of machine learning applications, virtual and mixed reality on a limited power budget, the accelerating growth in pre-5G data speeds, and higher quality multimedia capture and streaming. The Snapdragon 845 is currently sampling to Qualcomm’s customers and is expected to begin shipping in commercial devices in early 2018. Xiaomi has already confirmed it will be using the 845 in its next flagship smartphone, and we’re not far away from major announcements from Samsung, LG, and others that are almost certain to follow suite.